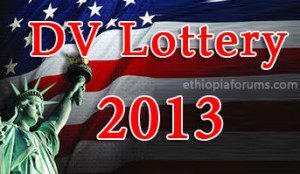 : Applicants in the Diversity Visa 2013 program may check the status of their entries through Entrant Status Check on the E-DV website beginning on May 1, 2012 through September 30, 2013. Please remember to keep your confirmation, since more DV 2013 entrants may be selected on October 1, 2012. 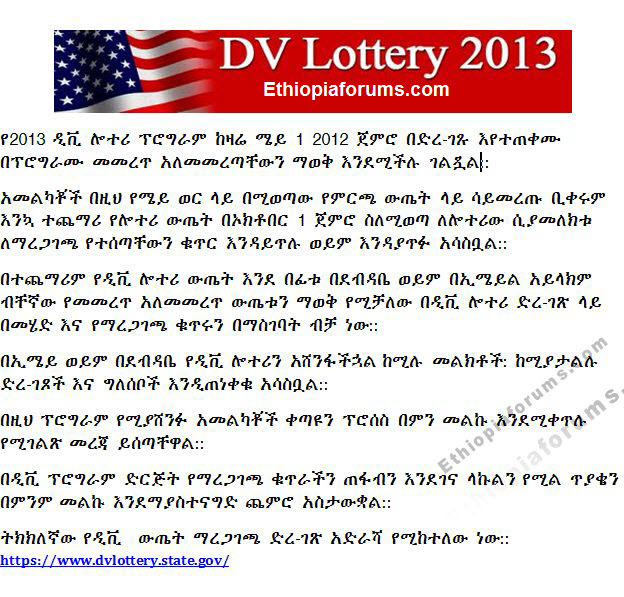 On May 1, 2012 at noon Eastern Daylight Time (EDT) (GMT-4), In Ethiopian time 8 PM entrants from DV 2013 (those who submitted entry between October 4, 2011 and November 5, 2011) may check the status of their entry using the confirmation number through Entrant Status Check on the E-DV website. Be advised that additional DV 2013 entrants MAY be selected beginning October 1, 2012. The DV-2013 registration period was from October 4, 2011, until November 5, 2011.
and does not use email to notify DV entrants of their selection in the DV program.